I am asked, quite frequently, about Acrophoca longirostris. What is it? It’s a fossil seal from the Miocene and Pliocene Pacific coast of South America, described from good fossils by Christian de Muizon in 1981. Within the seal, or phocid, family, it belongs to a group called the monachines: the monk seals (monachins), elephant seals (miroungins), and Antarctic seals (lobodontins). As fossil tetrapods go, seals aren’t regarded as particularly charismatic, nor do they attract much attention away from a handful of specialists. So what makes Acrophoca so interesting? 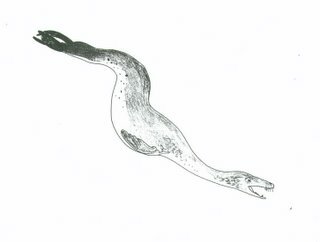 It’s the contention that this animal should be regarded as a ‘swan-necked seal’: a pinniped that was sort of something like a mammalian version of a plesiosaur. Life restorations of Acrophoca are few are far between, but those that that have been published (on the cover of Muizon 1981, and in Naish 2001: reproduced above, at the correct orientation! ), or exist as museum murals (that at Karlsruhe’s Staalische Museum für Naturkunde), do indeed make this seal look particularly long-necked compared to living phocids. Barnes et al. (1985) even went so far as to describe Acrophoca as ‘serpentiform’ (p. 41). All in all, it sounds like Acrophoca would have looked particularly odd. So here’s the low-down. In 2002, new Acrophoca material from Chile was described by Stig Walsh and myself. While, based on various detailed differences, it seemed likely that we had a species distinct from A. longirostris, we elected to leave the Chilean material as Acrophoca sp. This was sensible, because Stig’s observations revealed that there was evidence for multiple Acrophoca species known from various horizons within the Miocene-Pliocene coastal sediments of Peru. Accordingly, we wrote ‘We have elected not to name [this] possible new species at this time because new Peruvian material of … Acrophoca … is under description and new species, represented by substantial remains, have been recovered (Muizon, pers. comm. 2000)’ (p. 840). Exactly this has turned out to the case for some of the other marine mammals known from these sediments. The bizarre ‘swimming sloth’ Thalassocnus, for example, was originally described for a single species (T. natans) assumed to be a one off. We now know that it was just one of several species within this genus, some of which were far more specialised for marine life than was T. natans. The youngest species, T. carolomartini and T. yaucensis, are poorly known, but what is known suggests that they were seal-like in some of their features, rather than sloth-like (Muizon et al. 2004) [for more on these sloths go here]. Given that one of the undescribed Acrophoca species is much longer-skulled than A. longirostris (Walsh & Naish 2002) – already notable for its long skull (hence the name) – it’s conceivable that, as in Thalassocnus, some of the as-yet-unnamed species were altogether weirder looking. But we won’t know this for sure until they get described. Watch this space. Was Acrophoca really ‘swan necked’? Well, judging from the specimens that Muizon described, it wouldn’t have had a neck anywhere as near as long (proportionally) as that of a plesiosaur, but it still would have looked longer in the neck than any extant seal: Muizon’s (1981) data shows that Acrophoca far exceeds other monachines in the length of its cervical vertebrae, and in total cervical column length. Based on similar-sized individuals, extant monachines have cervical column lengths of 218-249 mm, while Acrophoca is at 329 mm. King (1983) showed that in most seals, cervical column length is between 17 and 19% of the total length of the vertebral column – not different from terrestrial carnivorans like dogs (also 17%). In Muizon’s skeletal reconstruction, the neck length of Acrophoca is about 21% of total vertebral column length. So, yes, a bit longer-necked than living seals, but ‘swan-necked’? Well, even living pinnipeds that we don’t regard as particularly long-necked have necks flexible enough to allow a startling lengthening effect when they lunge, stretch or spy-hop. Bonner (1994) noted that a seal can ‘extend its neck suddenly when it strikes prey. Seals can do the same thing on land, as many a seal researcher has discovered to his or her cost’ (p. 18). This applies particularly for some otariids and for lobodontins like Hydrurga. What I’m getting at is that, when alive, Acrophoca would have been capable of looking even longer in the neck than we might think just from its fossils. But clearly it’s a stretch to imagine this animal as having a long long long neck like a swan, or a plesiosaur, so, sadly, ‘swan-necked seal’ really is a bit of an exaggeration. The phylogenetic affinities of Acrophoca might also tell us something about its appearance in life. The problem is that this is a particularly contentious topic among seal experts. Muizon (1981) regarded Acrophoca as a lobodontin: that is, a member of the group that includes Hydrurga (the leopard seal), Ommatophoca (Ross’ seal) and Lobodon (the crabeater seal), and specifically as the sister-taxon to Hydrurga. Though it’s been suggested that lobodontins might be paraphyletic with respect to Monachus (a highly problematic genus within seal phylogeny), most recent studies have supported lobodontin monophyly (Bininda-Emonds et al. 1999). If Acrophoca is a member of this group, as Muizon (and Walsh & Naish) concluded, then we should be thinking of living lobodontins, and specifically Hydrurga, as the closest extant models. And I find that particularly interesting, because it’s my opinion that Hydrurga is one of the most ‘disturbing’ looking of all mammals: it’s a chunky mother of a seal – thickset and quasi-reptilian, with a theropod-like jaw line and robust skull demarcated from its neck. I would imagine Acrophoca as a paradoxical combination of these traits: quasi-reptilian and Hydrurga-like on one hand, but also longer-skulled, longer-necked and overall more gracile. It would have been odd, and don’t forget that other species in the genus would have looked even odder. Right, back to work. I have Crato Formation turtles and British big cats to be dealt with in the next few days. More to come on those topics here soon. Barnes, L. G., Domning, D. & Ray, C. E. 1985. Status of studies on fossil marine mammals. Marine Mammal Science 1, 15-53. Bininda-Emonds, O. R. P., Gittleman, J. L. & Purvis, A. 1999. Building large trees by combining phylogenetic information: a complete phylogeny of the extant Carnivora (Mammalia). Biological Reviews 74, 143-175. Bonner, N. 1994. Seals and Sea Lions of the World. Blandford (London), pp. 224. King, J. E. 1983. Seals of the World. British Museum (Natural History) (London), pp. 240. Muizon, C. de 1981. Les vertébrés fossiles de la formation Pisco (Pérou). Première partie: deux nouveaux Monachinae (Phocidae, Mammalia) du Pliocene de Sud-Sacaco. Travaux de l’Insitut Français d’Études Andines 22, 1-161. - ., McDonald, H. G., Salas, R. & Urbina, M. 2004. The youngest species of the aquatic sloth Thalassocnus and a reassessment of the relationships of the nothrothere sloths (Mammalia: Xenarthra). Journal of Vertebrate Paleontology 24, 387-397. Naish, D. 2001. Sea serpents, seals and coelacanths: an attempt at a holistic approach to the identity of large aquatic cryptids. In Simmons, I. & Quin, M. (eds) Fortean Studies Volume 7. John Brown Publishing (London), pp. 75-94. Walsh, S. A. & Naish, D. 2002. Fossil seals from late Neogene deposits in South America: a new pinniped (Carnivora, Mammalia) assemblage from Chile. Palaeontology 45, 821-842.